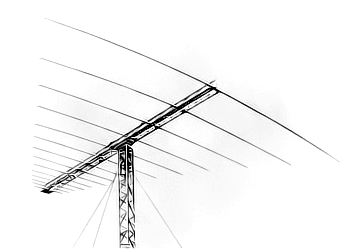 Log Periodic Dipole Array (LPDA) antennas have very broadband characteristics and are suitable for HF multi-band operation. LPDA is a directional antenna with good forward gain and acceptable front-to back (F/B) ratio. The only down-side of the LPDA is its big size. Being a virtual environment, size is of no consequence on HS4. We can afford to deploy and use large antennas on the system. A typical Log Periodic antenna can easily cover almost the entire HF spectrum while maintaining excellent SWR and feed-point impedance characteristics. LPDA allows a very simple interface to the transmission line. Complex impedance matching arrangement is not required to drive the LPDA. A 50 ohm co-ax cable with a 1:1 Balun is all that is needed to achieve excellent performance across all bands.